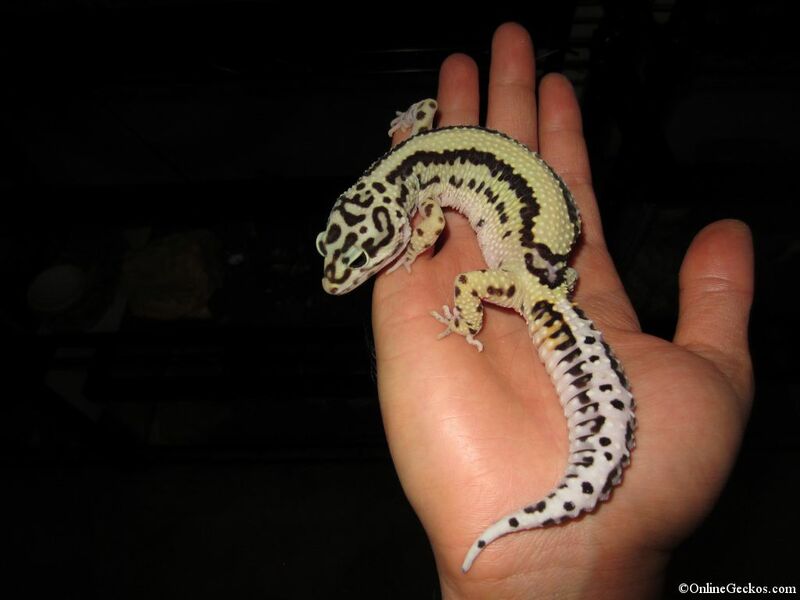 Our Leopard Gecko Collection and Breeders - Leopard Geckos For Sale - Quality Gecko Breeder - Fair Prices - Tremper - Bell - Rainwater - Giant - Mack Snow - Albino - Tangerine - Fattail For incubators we use double Natures Spirit incubators. 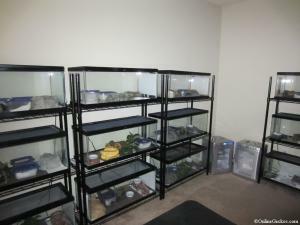 We also hand build our 20 gallon tanks for our breeders, all housed on tiles and visually pleasing decorations. All of our geckos are living comfortably and they are all treated with care and love. 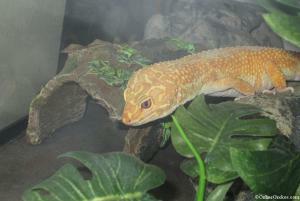 This is our beloved Zeus, a beautiful giant tremper sunglow. 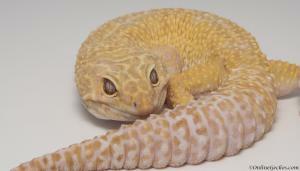 He was our first breeder male in our collection; hence we gave him the most important name in Greek Mythology, Zeus. 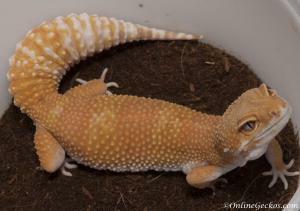 While he isn't the biggest male we have (he weighs 100g), he is a really stunning giant sunglow. His body is smooth and his colors really pop, he is in every definition a high quality tremper sunglow. His gentle and docile personality has allowed us to take numerous pictures. You may have seen his pictures used as our forum icons and website logos. The really unique picture we've used heavily is the one with his arm hanging and hand spread out. That's a real "in the moment" picture, totally unplanned and unexpected. It's in no way photoshoped. Expect some great looking offspring from Zeus in the future. Apollo is a monster, he is the grandson of the famous Moose. 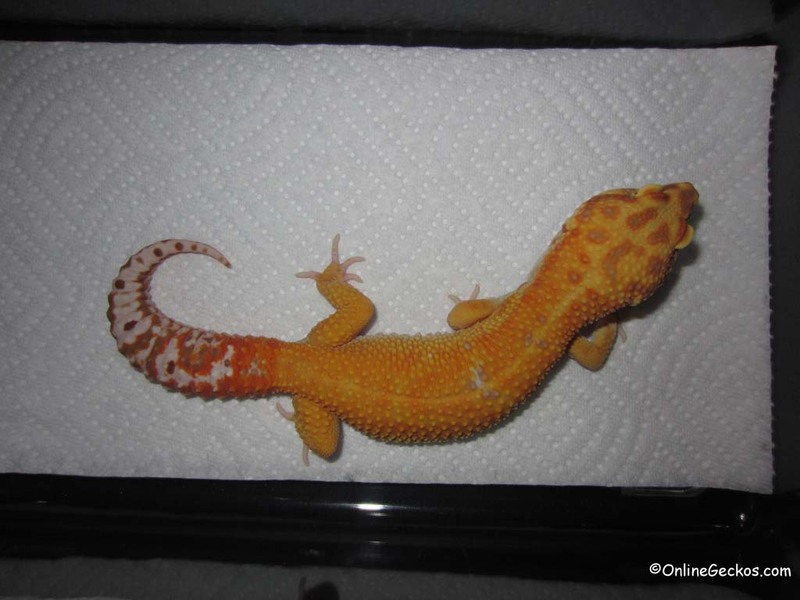 He is barely over a year old and is weighing in at 130g already (he is now 148g as of 1/15/2013), with plenty of room to grow. 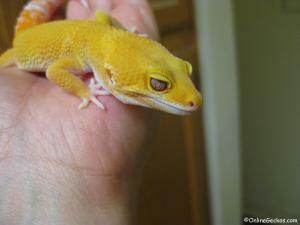 Named after Greek's God of the Sun, Apollo has intense orange/yellow color throughout his body. He also has beautiful head patterns. We nicknamed him "Big Daddy" here because he's currently the largest male gecko we have. Plus when he gets with the females, despite his size, he is quite gentle with them...and he always gets the job done. He is an awesome breeder that will add size to our super giant projects. Ares, Greek's God of War, he is ever so appropriately named because he is massive and fierce looking. 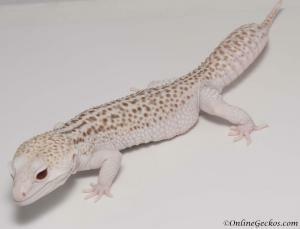 This is our 170g super giant mack snow raptor. He reached over 120g within 7 months, and kept growing until he was about 2 years old. 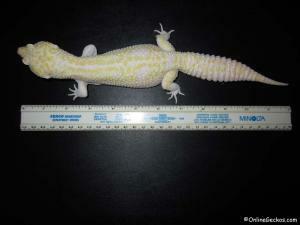 He is over 12 inches long! This beautiful mack snow raptor has two solid ruby red eyes. 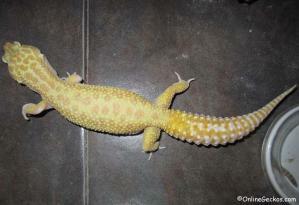 You can see by his tail, it's proportional to his body, so he is not just another overweight "super giant". He is a real solid, grade A+ genetic super giant. We will be utilizing him quite a bit to add size to our collection. Truth be known, he is probably one of the most docile super giants around. We love his friendly personality, and we hope his size and personality will get passed down to his offspring. Hyperion was the Titan god of Light. He is a very robust giant extreme emerine, weighing in at 100g at barely 1 year old. 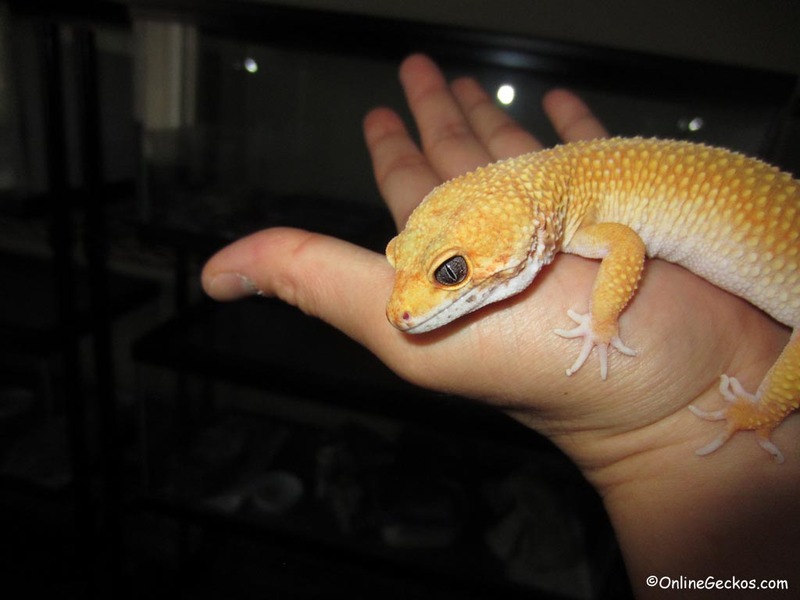 He is 100% pure tremper genetics, we obtained him from Ron Tremper himself. 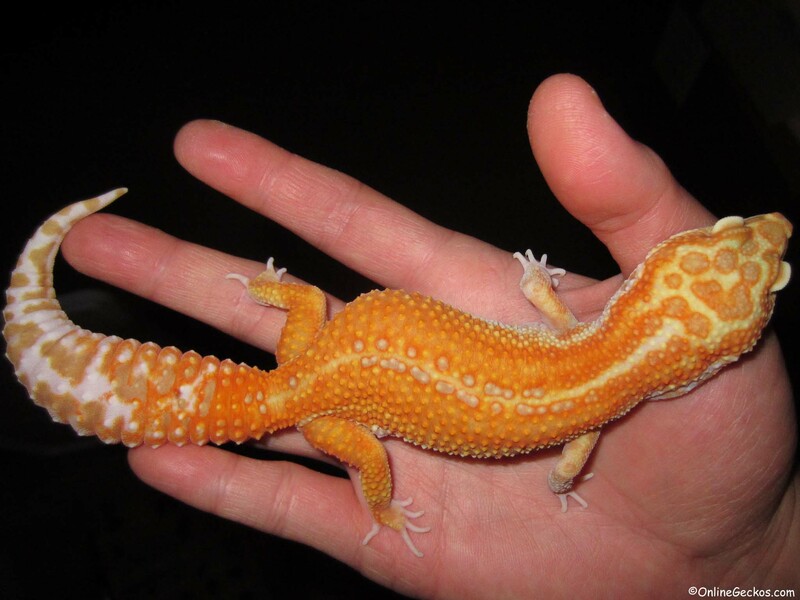 This gecko has such intense hot tangerine color, pictures can't even capture it. We obtained him to give us more flexibility with our tremper lines, as well as give us an opportunity to add/enhance color with some of our breeding projects. Kronos is our high quality broken reverse stripe radar, we obtained him from Brittney Gougeon. 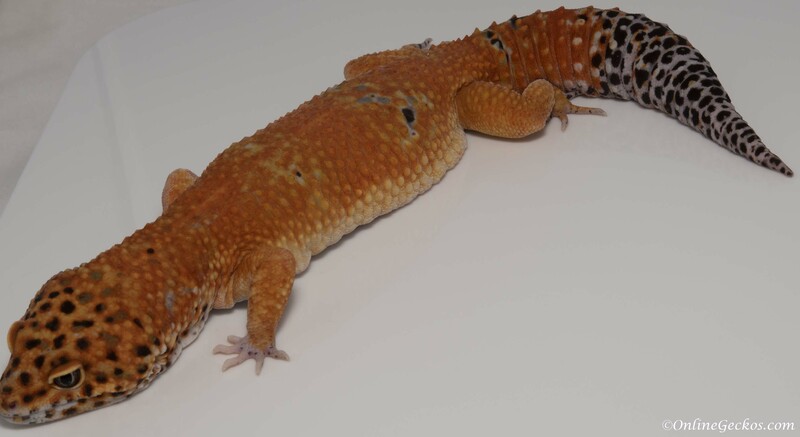 He is a robust male, weighing in at over 75g at just 1 year old. 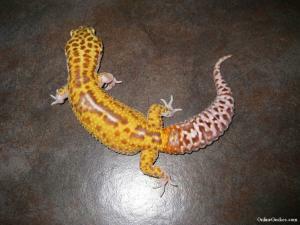 He has intense tangerine coloring on his body, with broken reverse stripe showing lavender influence. 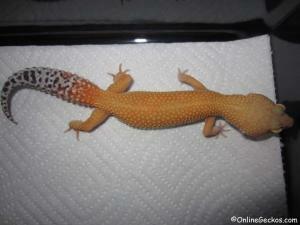 He has carrot coloring at the base of his beautiful plump tail, and 4 cute white feet. 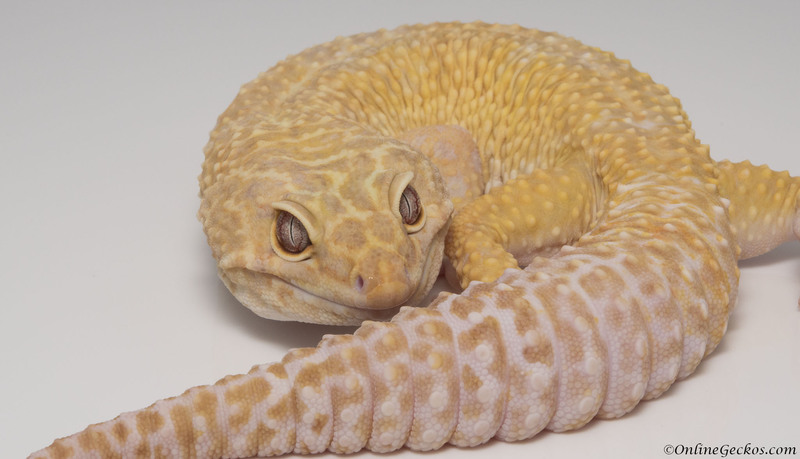 His docile, friendly personality makes him one of our favorites in our collection. 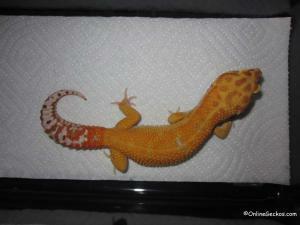 Kratos is an amazing HOT Blood Tangerine male. 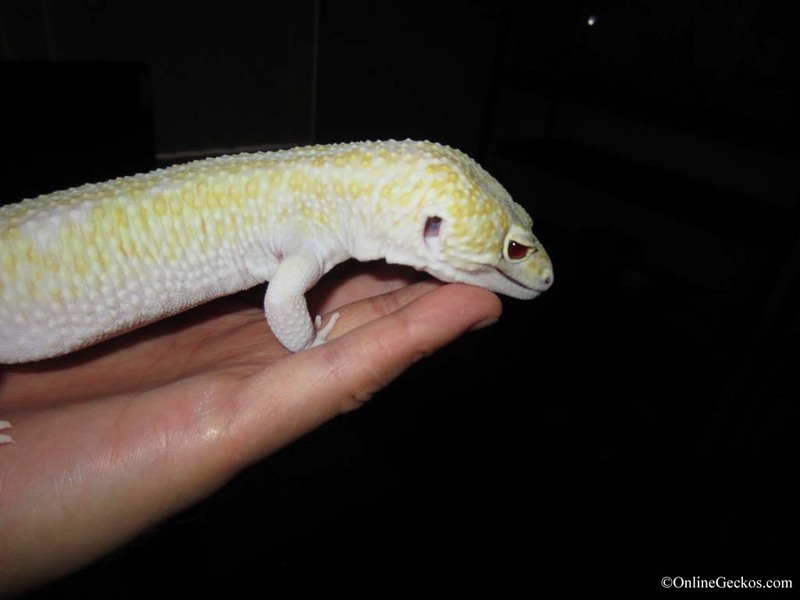 He is het for Tremper Albino so we are able to use this boy to produce some of the best looking Blood Tangerine and Blood Albinos around. Kratos is the divine personification of strength in Greek Mythology. 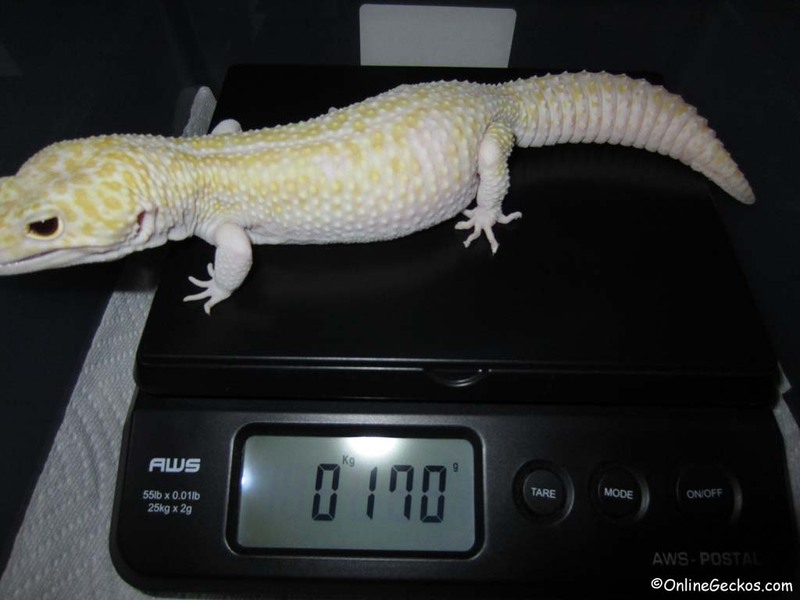 He is a big boy, weighs in at almost 90g and there's no giant genetics in him. 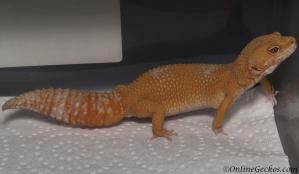 We just love everything about Kratos, from the dark spotting on the head to the deep blood tangerine coloration on the body, and the deep red carrot-tail. Look out for some great looking offspring from him starting in 2018. 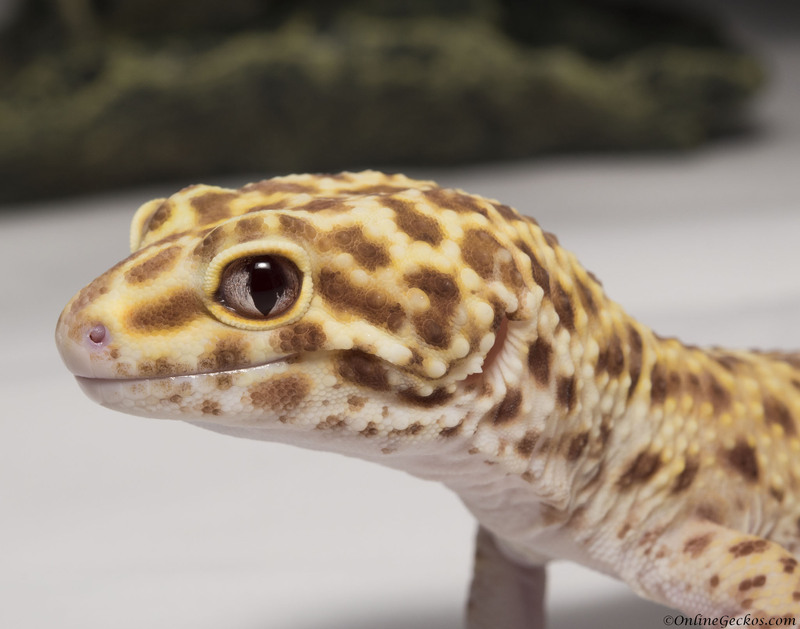 Atlas is a special looking leopard gecko. 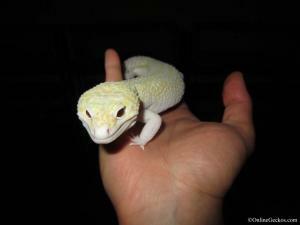 He is a Super Radar, a Super Snow form of Bell Albino Eclipse. That irresistible white nose, high white sides, and snow patterns, we just adore him. 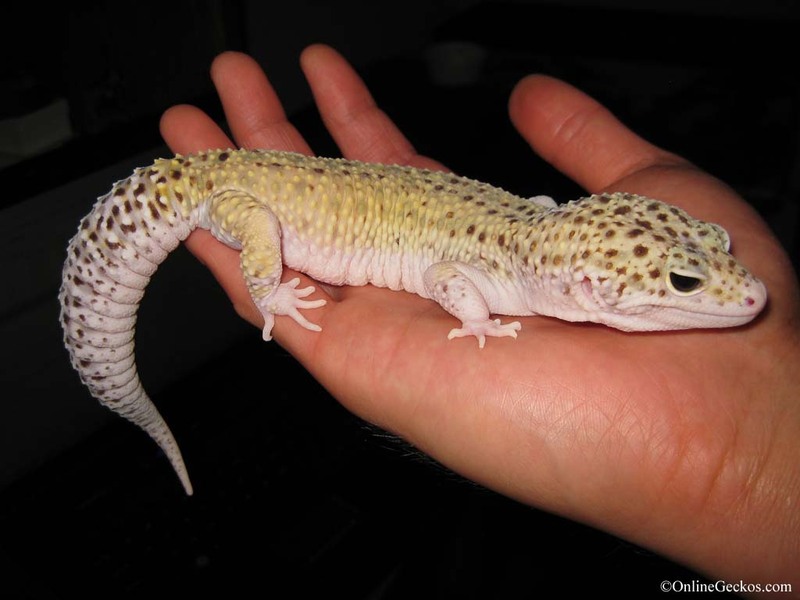 He's a very big and long gecko, one of the largest Super Radars we've seen. On top of it all he's ultra friendly. We are hoping to produce some of the finest and most docile Super Radars and Mack Snow Radars with him. 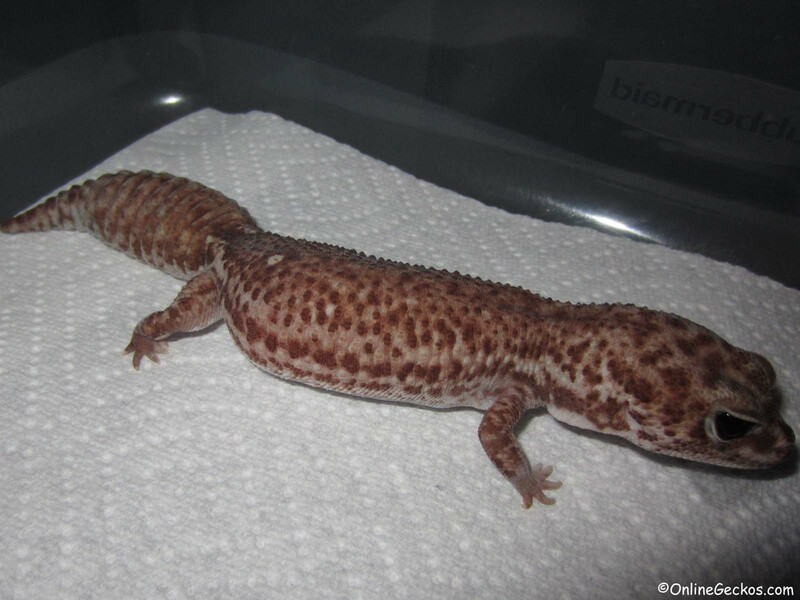 Artemis is our special Blood Super Hypo, honestly one of the best looking Bloods we've seen. It's hard to capture the redness on camera due to camera flash, but she is truly a magnificent specimen. We look forward to producing some superb looking Bloods with her. We will be using her to enhance our tangerine collection. 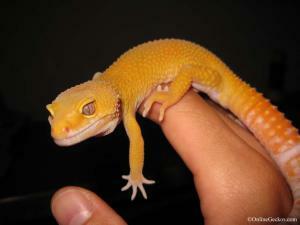 We have a large collection of super hypo tangerine carrot-tail geckos. They are some of the finest tangerines with the best genetics. It's our goal to enhance our tangerine collection with selective breeding. It'll take some time, but it'll be worth it. Everybody loves a good looking tangerine. We'll add more pictures as we get a chance to take more pictures of our tangerine breeders. 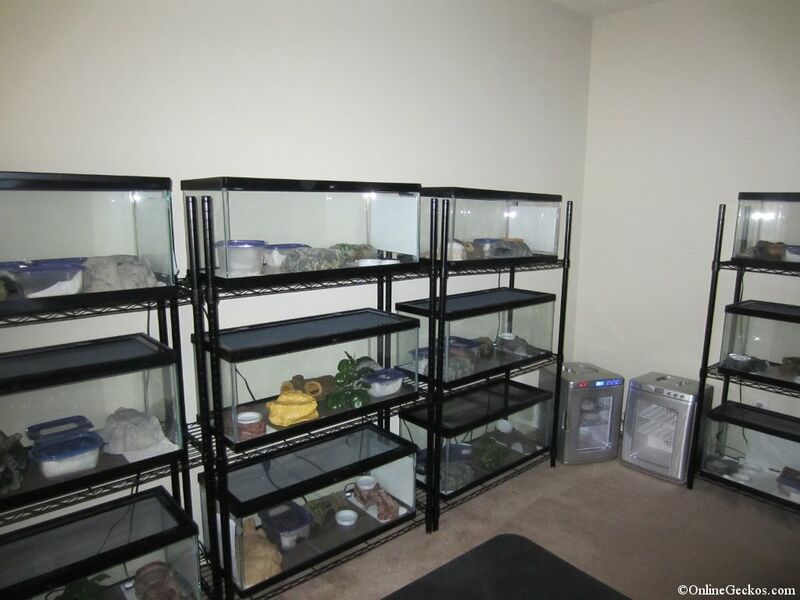 First picture is the male, the others are females. Aether is our keystone White Knight breeder. He's a triple gene gecko of Bell Albino + Eclipse + Blizzard, White Knights are currently rare and precious. 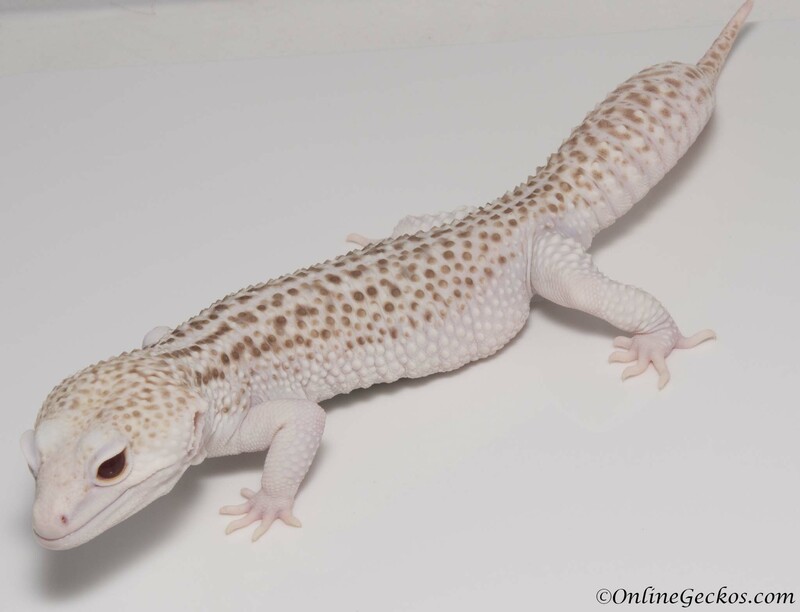 He is extremely handsome, with that white head, double solid candy apple red eyes, light lemon yellow body, and white tail. He is the very definition of a high quality White Knight. 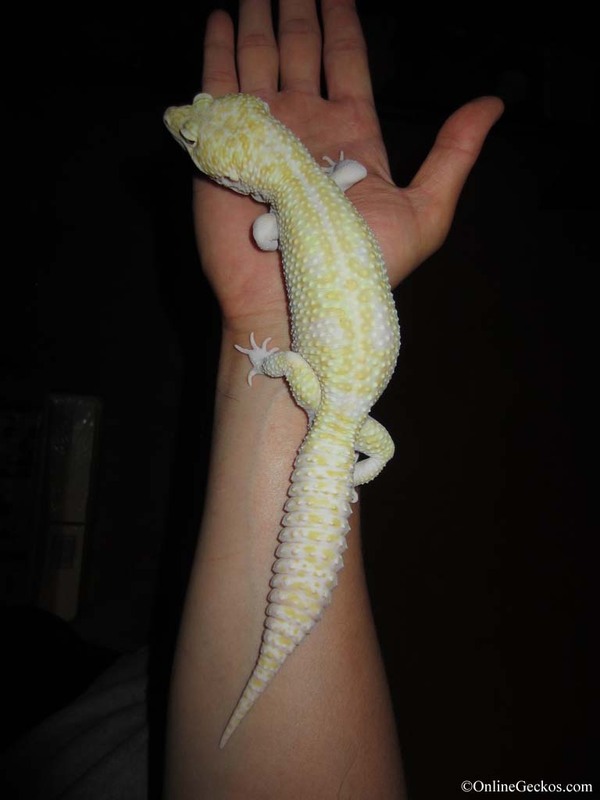 Aether is a very fertile breeder, so expect some great looking White Knights, Radar het White Knights, and Mack Snow White Knights from him. 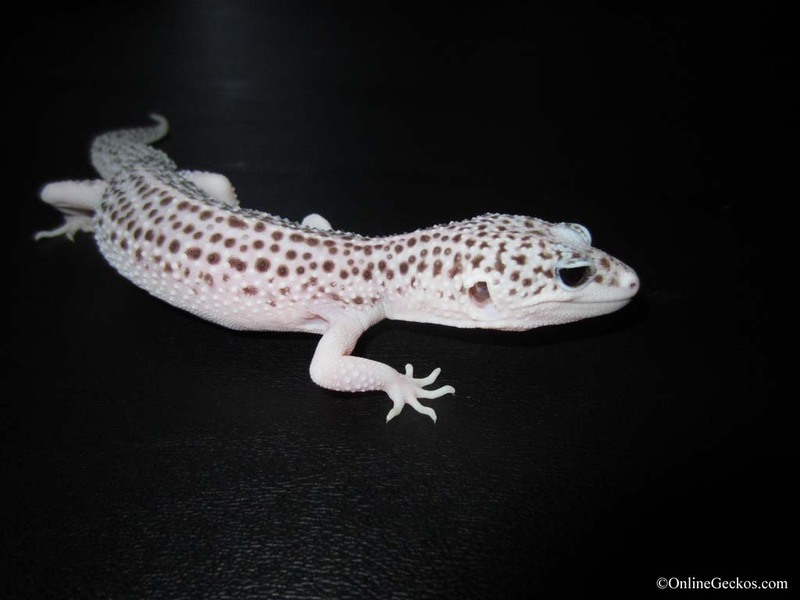 Aphrodite is the Snow White of our breeder collection. 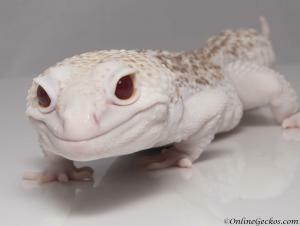 She's is a mesmerizing looking gecko with her white body and bright red eyes. White Knight is a combination of Bell Albino + Eclipse + Blizzard. Most people are familiar with Diablo Blancos. 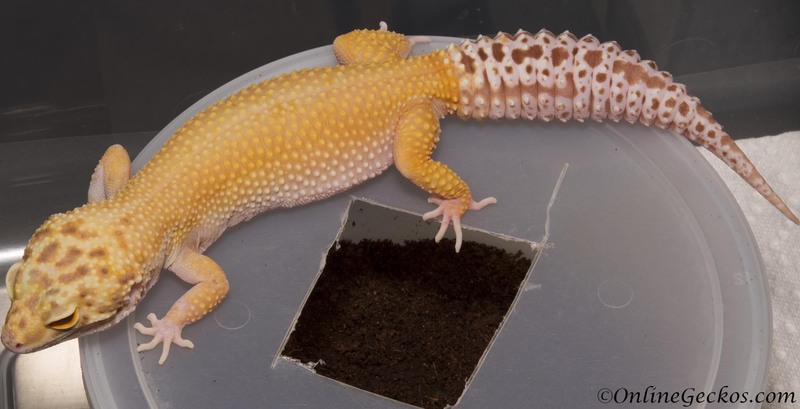 The main difference between White Knight and Diablo Blanco is that Diablo Blanco carries the Tremper Albino gene, while White Knight carries the Bell Albino gene. Another difference you will notice is Diablo Blancos have deeper red eyes, while White Knights have brighter, candy apple red eyes. You notice the same eye shade differences between Radars (bell albino eclipse) and Raptors (tremper albino eclipse). Mack Snow White Knights are very rare at the moment, so she is our treasure, our pride and joy. 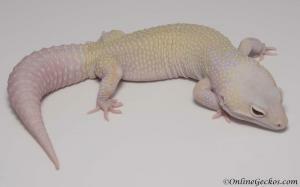 Electra is a hot HOT looking blood albino. Again camera can't capture the red color very well with flash. But you get an idea of just how exotic looking Electra is. She has a docile personality, and she breeds well. 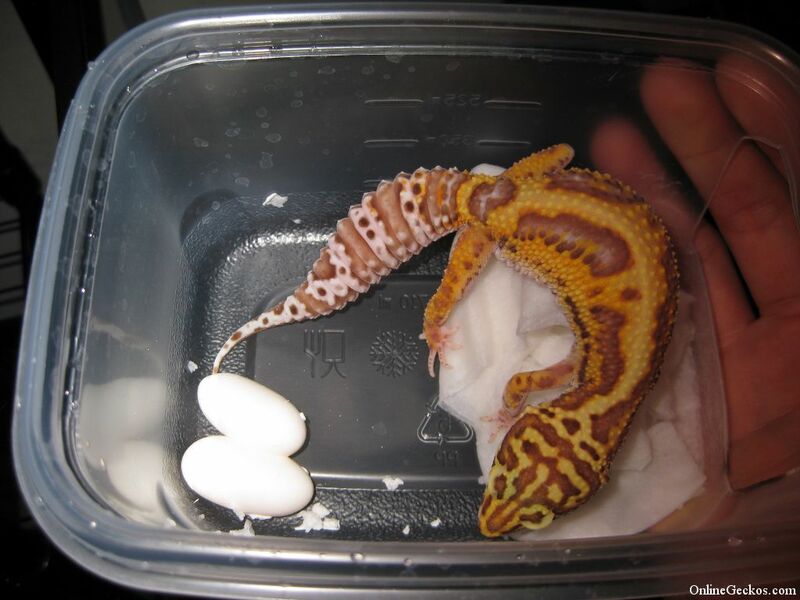 She laid some healthy eggs this season for us, so stay tuned! Iris was the personification of the rainbow in Greek Mythology. 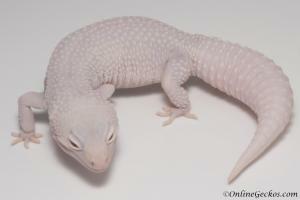 This is another high quality HOT HOT looking blood albino breeder female. One of the cool things about blood albinos is how red their eyes look. We were able to capture it, see the picture above. There's just nothing like it. We are utilizing these Blood Albinos to further enhance our own Blood Super Hypo, Tangerine, and Blood Albino genes. Styx, goddess of River Styx, a Titan of Greek Mythology. Styx is a very good looking Tangerine Radar. 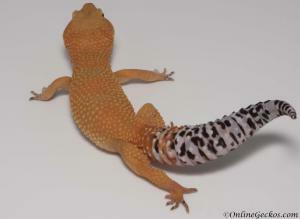 She's selected for her clean sunglow looking body, and very pretty tail patterns. 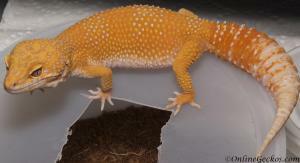 By pairing her up with Kronos, our main Radar male breeder, we were able to produce amazing looking Radars. Here are a couple of examples from 2017, amazing Radar female, amazing Radar male. Pheme, goddess of fame. 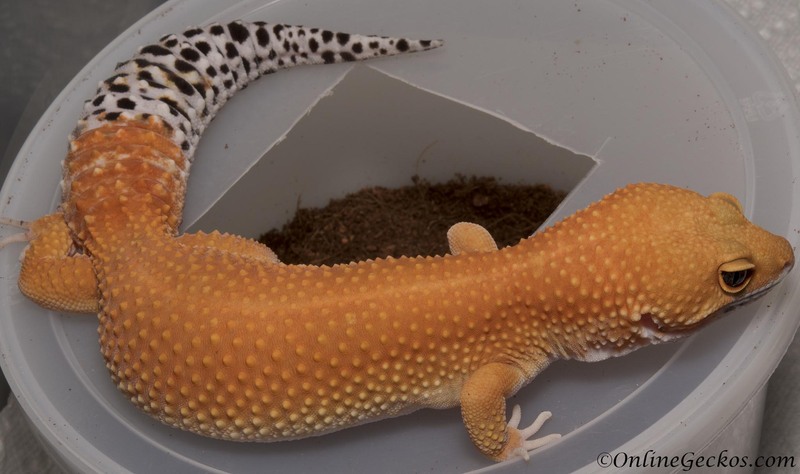 There are Tremper Sunglows, and then there are Tremper SUNGLOWS. Pheme is one of a kind sunglow that will leave you speechless. Her colors are fiery hot, one of the deepest orange we've seen on a Tremper Sunglow anywhere. 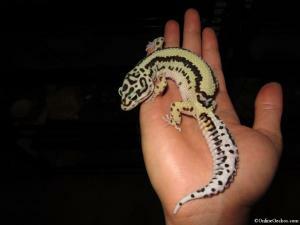 She's an extremely friendly leopard gecko breeder. We will be utilizing her to improve the colors of our sunglows collection. Calliope is an exotic looking giant extreme emerine leopard gecko. Her beautiful colors and patterns are out of this world. We have produced many great looking hatchlings from her in 2017. They should make their debut on the site late 2017 or early 2018. Look out for them soon! 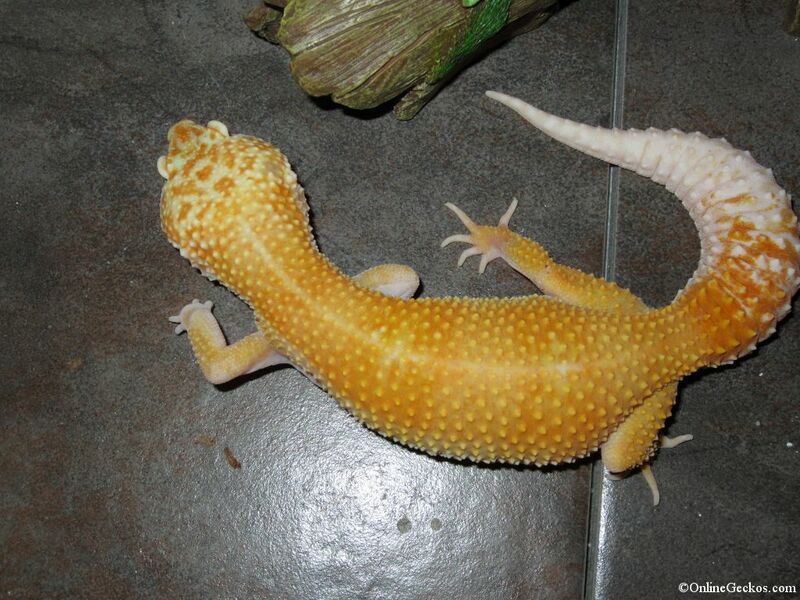 Cassandra is Apollo's wife, she's a proven super giant sunglow weighing over 100g (she is now 123g as of 5/17/2013). She is the great granddaughter of Moose. She has beautiful coloring, starting with unique red speckled patterns on her head, to beautiful tangerine coloring on the body, to an amazing long carrot-tail with pure white tip. She has amazing docile personality. 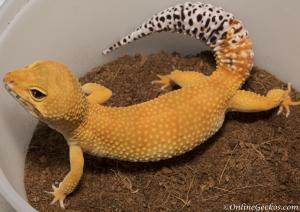 So far she is one of our best breeders as she feeds well and has been laying fertile eggs for us. Adonis is our Giant Mack Snow Eclipse. He is a very cute and curious boy. With his trademark Eclipse white nose and white speckled tail, he's truly a beautiful gecko. He has double solid black eyes, and currently weighs around 100g. He's our keystone male for a lot of our projects involving mack snow genetics. One of his offspring is a beautiful Total Eclipse female holdback. Persephone, Queen of the Underworld. 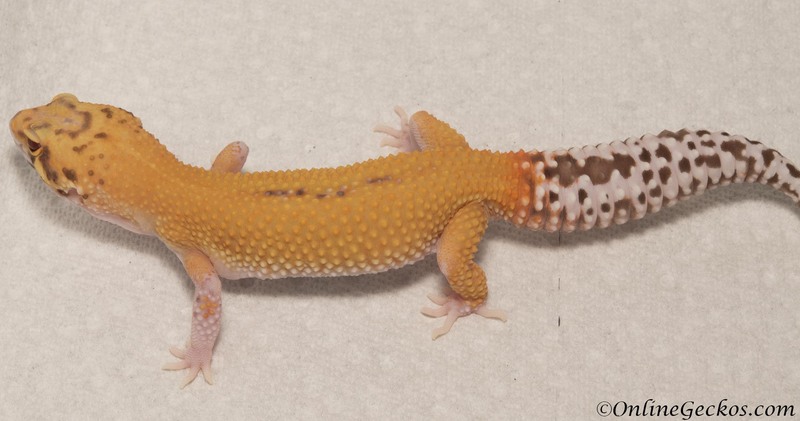 This absolutely stunning gecko has solid black eyes, with black speckled dots on a white body background. She has the trademark eclipse white nose and tail tip, as well as 4 cute white feet. She is the daughter of Adonis above. 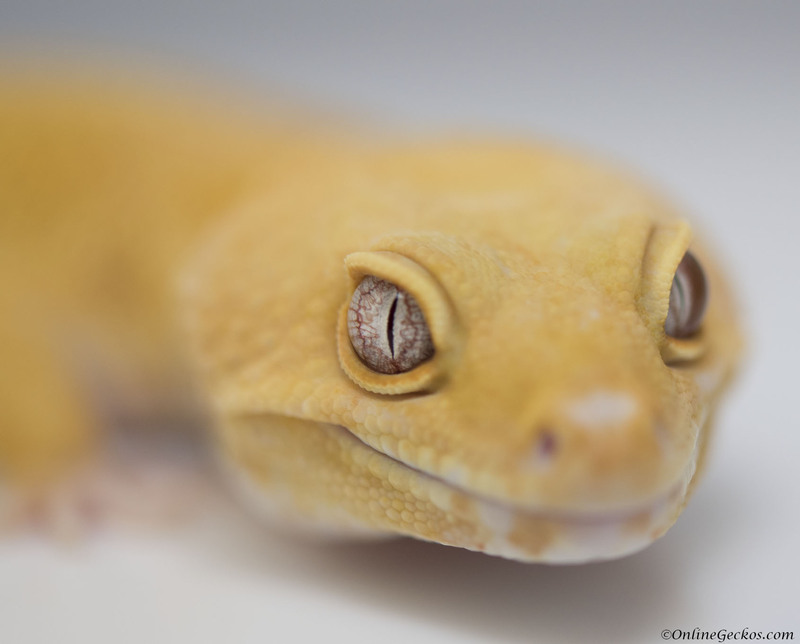 Really one of a kind gecko, we absolutely adore her. She is currently breeding well for us, we hope to produce more beautiful mack snows and super snows with her. Athena is a very good looking super giant raptor female. 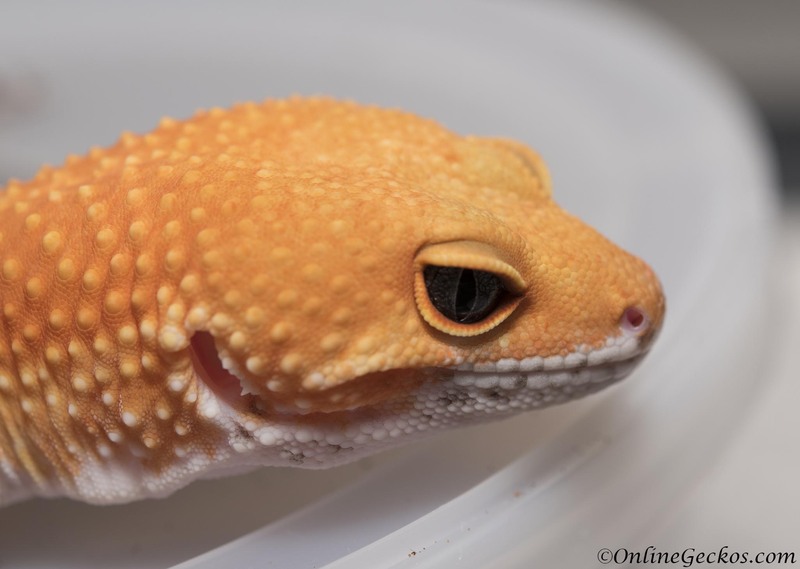 She has double solid ruby red eyes, and very cute dotted patterns going down back. Her tail is also very beautiful. 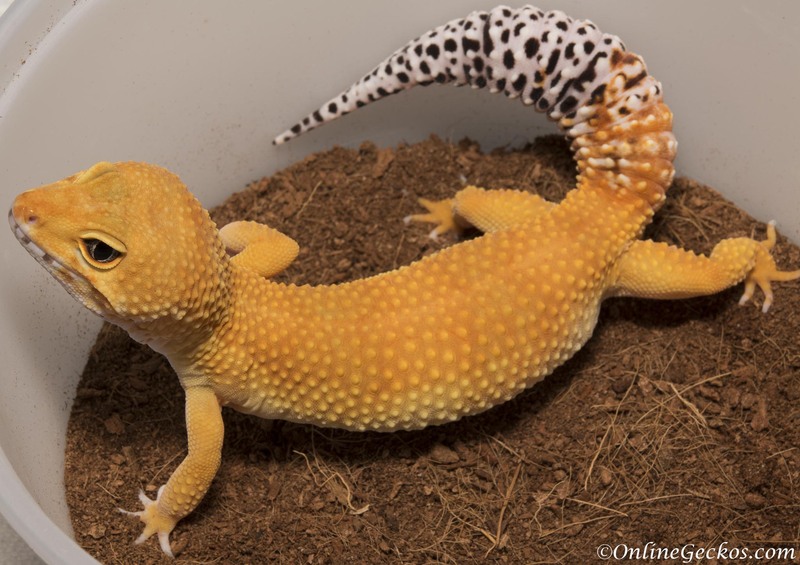 She's a very docile female, who has been laying good fertile eggs for us. She currently weighs around 100g. 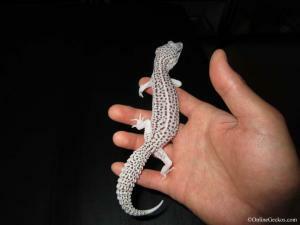 We hope to produce some great looking super giant raptors/mack snow raptors with her. 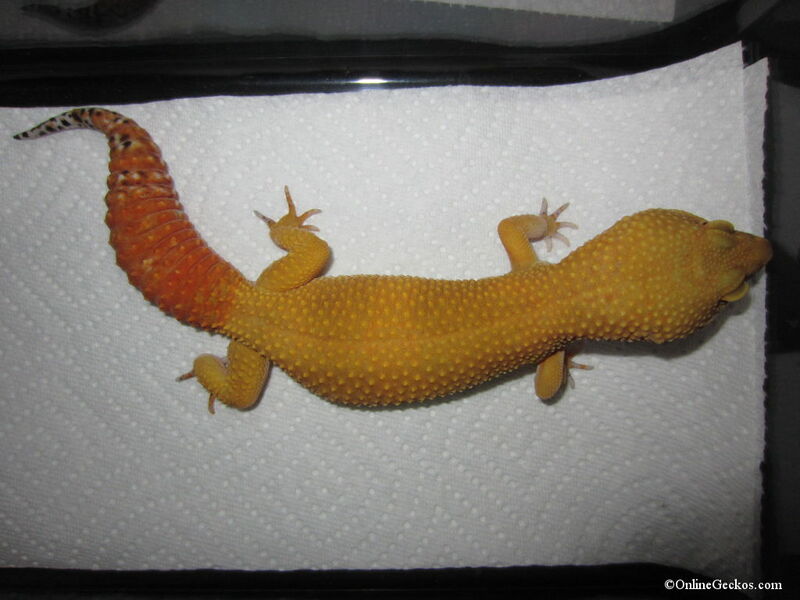 Helios, the Titan god of the Sun, his name was chosen based on the intense tangerine color on his body, and his deep near 100% full carrot-tail. This robust SHTCTB boy is a cross between a Blood Hypo and a SHTCTB. The result is an exceptional looking SHTCTB with deeper tangerine color than standard SHTCTB's, and his deep orange full carrot-tail is nothing short of icing on the cake. He has been a good breeder for us, we look forward to producing some exceptional looking SHTCTB's with this boy. 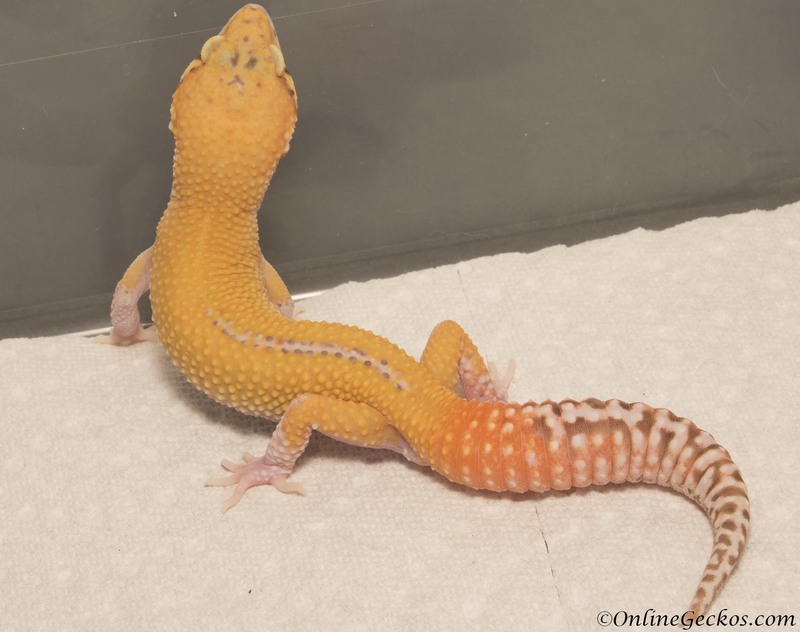 Selene is a very petite and cute super hypo tangerine carrot-tail baldy. 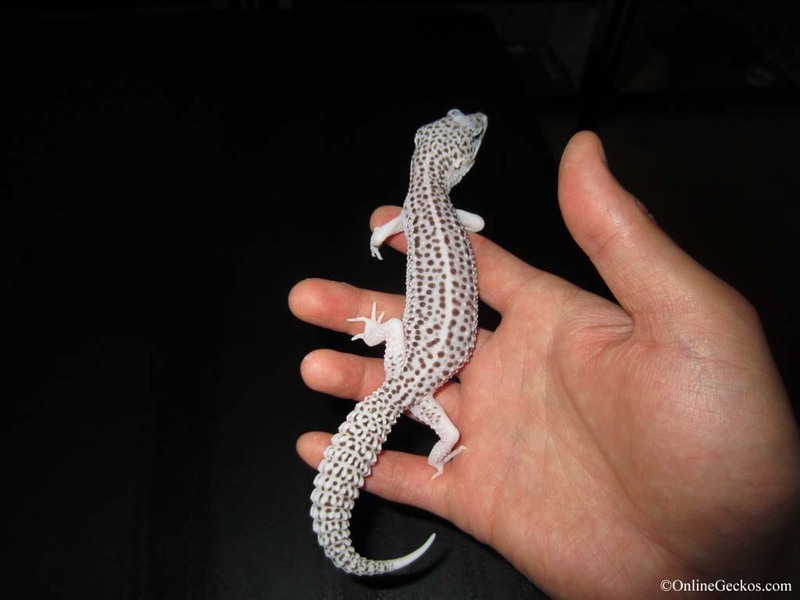 She is smaller and lighter in weight than most of the females we have here in our collection. But don't let that fool you, she breeds like a champ. She has been laying good, fertile eggs for us. We absolutely adore her. Eos is our beautiful super hypo tangerine carrot-tail baldy female. 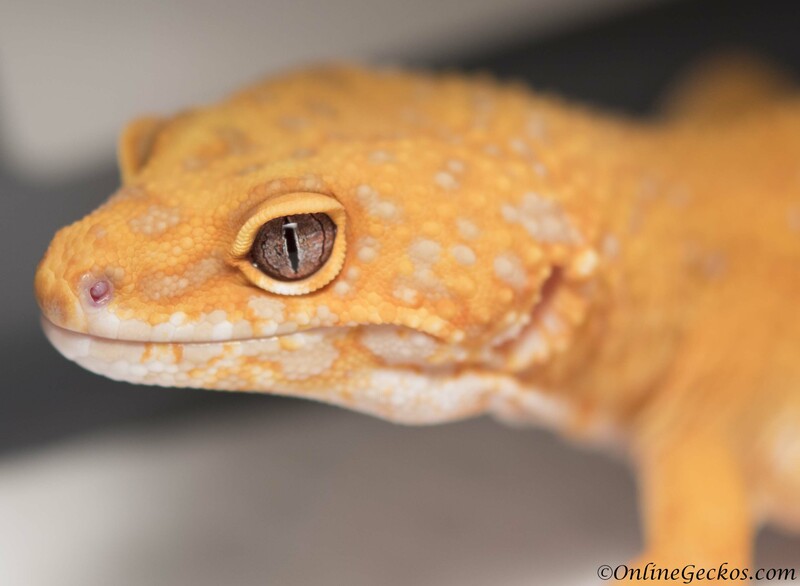 She has a very cute head with large eyes, one look at her and you just want to say "awww.." She is a very fine example of a high quality super hypo tangerine carrot-tail baldy leopard gecko. She feeds well, and is mild tempered. We look forward to producing great looking SHTCTB's with her. Ananke is a beautiful bold jungle bell albino het radar female. She has very distinct bold jungle patterns with lavender influence. Her bold head patterns are also very unique. This picture is very special to us because she is the first female to lay 2 healthy eggs that hatched into our first two beautiful hatchlings. You can view the hatchling videos on our youtube channel. 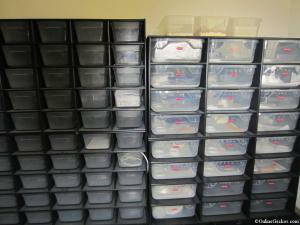 We've decided to leave this picture as-is and keep it permanently on our collection page. 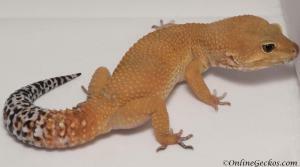 Hebe is a very pretty double solid black eyes eclipse het radar (het bell) female. 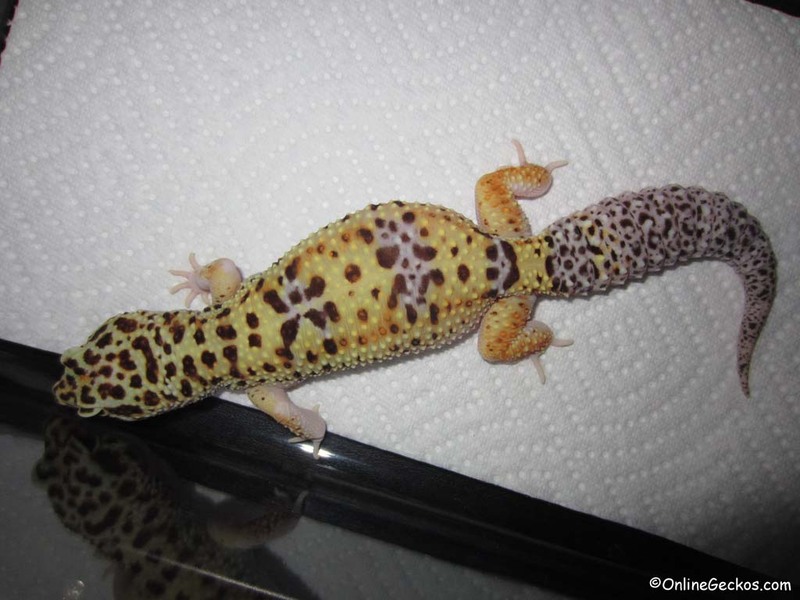 She has beautiful speckled eclipse tail, and very pretty patterns on her back. She's a robust female who feeds well and has been laying fertile eggs for us. She also has a very good personality. She'll produce some great looking eclipse & radar offspring. Eros, Greek's God of Love. He is named appropriately because he sure loves his ladies. Plus whenever we place our hands in the tank to pick him up, he starts trying to mate with our hands. No joke, you can't make this up. We do love this beautiful bandit male with a very distinct nose band, a trademark of bandit leopard geckos. He has bold stripes down his body and tail, along with bold head markings, There's a good amount of lavender on his body, you can really see the lavender getting passed down to his offsprings. He has all the qualities we look for in a good looking bandit leopard gecko. He makes for a great keystone male for our bandit projects. Enyo and Deino are the sisters of the Graeae in Greek Mythology. They aren't really blood related sisters as we obtained them from different breeders. But they are housed together in the same tank and they have never been aggressive to each other. So we gave them sister names as they look so cute together. Enyo is the one to the left, Deino the one on the right. 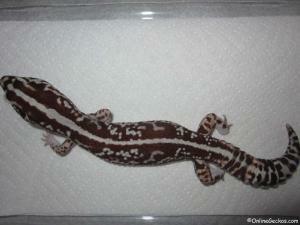 Both are exceptionally looking bandits with bold and clean stripes down their back. 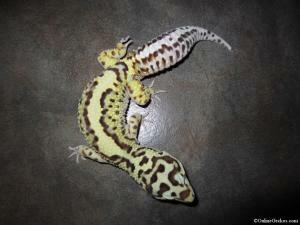 Both have dark bold patterns on their heads and down their tails, with a lot of lavender on their bodies. 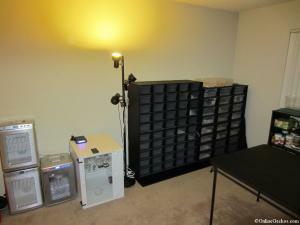 We carefully chose them for specific qualities that we are looking to improve on. Their hatchlings are nothing short of grade A+ looking bandits. 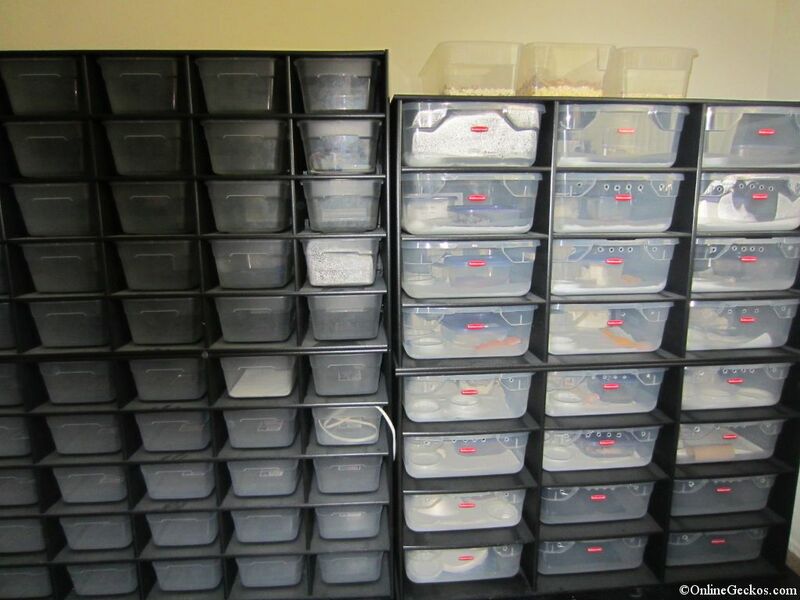 We picked them from different breeders in order to broaden the genetic pool. 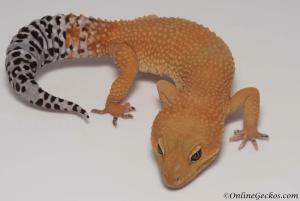 The results have been wonderful for us, we are really happy with our bandit breeding group. 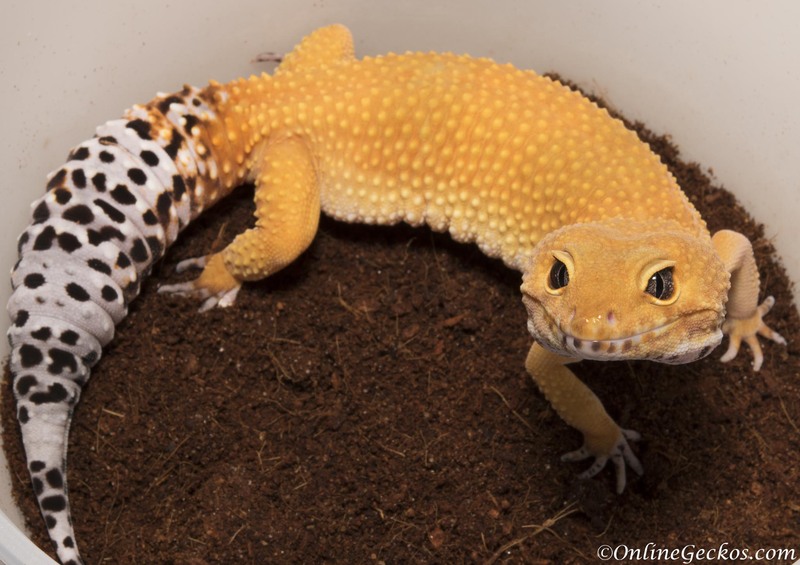 A funny fact, even though they live in the same tank, Enyo will only eat dubia roaches, while Deino will only eat superworms. So they are never in competition with each other over food. 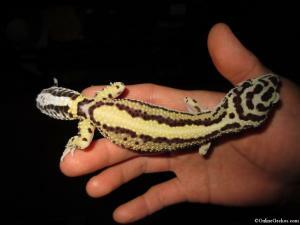 Titus is a very healthy and robust Striped White Out het Patternless african fat tail gecko. 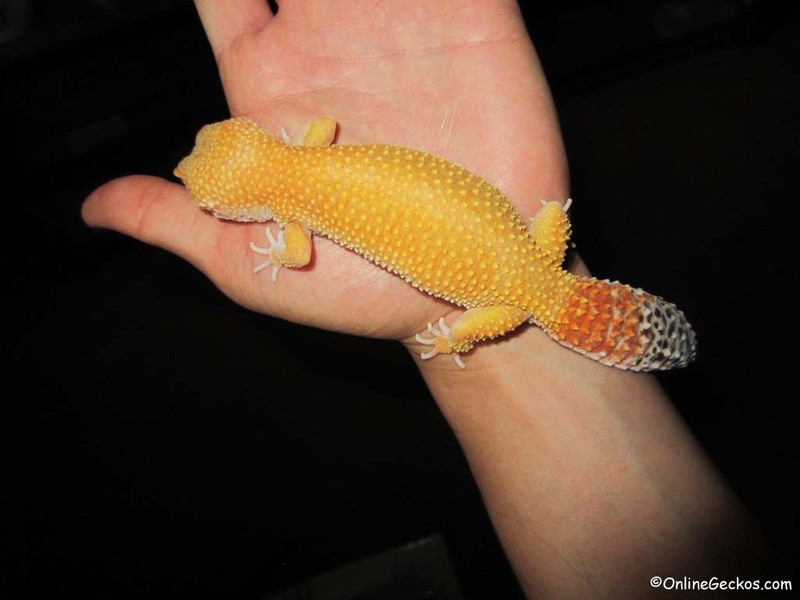 He was the first male african fat-tail we've acquired, so he is special to us. We raised him from hatchling, and he's now a full grown male breeder for us. We love his clean back stripe and body patterns. His offspring are grade A beautiful looking geckos. He has a very calm personality, a bit territorial, but it's to be expected with males. The beauty of Andromeda is unmatched. She's a very pretty patternless african fat tail gecko. Her big head and big bright eyes are absolutely adorable. She is extremely docile, always easy to hold. She also has a funny way of hunting her prey; the way she stalks and strikes never get old to watch. This gecko has produced many beautiful offspring, we look forward to more grade A offspring from her. Each year we will have some holdbacks. 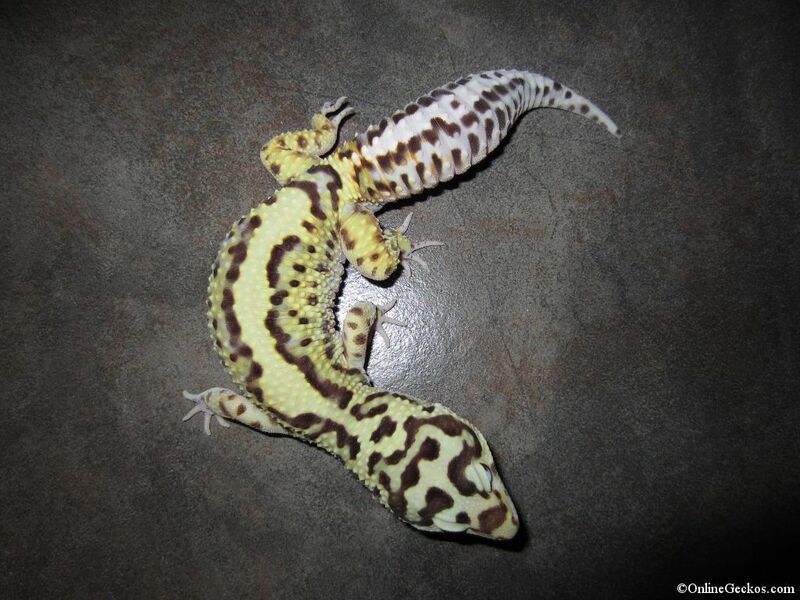 These are geckos we find exceptional and beautiful. 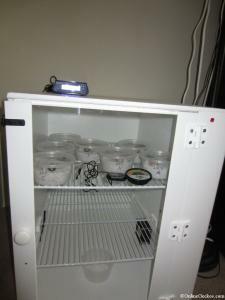 They will be used to start new projects or to improve on our existing breeding programs. So scroll on down below to see what we are holding back each year!